Glass is specified by many architects for the exterior of new buildings. It makes for an attractive building façade and helps keep the cost of interior lighting low. However, it often allows too much heat from the sun to enter the interior of buildings in the day, which increases cooling costs. It also allows too much heat to escape from the interior at night, which increases heating costs. The challenge is finding innovative ways to improve glazing technologies so that manufacturing costs remain low while also ensuring that the natural colorless appearance of glass is not compromised. Some heat-blocking coatings give the glass a less than desirable brown or reddish appearance. Assistant Professor Dr. Adel Gougam and a team of researchers at the Masdar Institute in Abu Dhabi may have found a way to significantly reduce the cost and complexity of manufacturing energy efficient glass coatings. “Although recent advances in glazing technologies have helped reduce heat transfer in glass buildings, the complex, multi-layered coatings that have been developed are often expensive and difficult to manufacture, adding to the glass’ economic and ecological costs,” explains professor Gougham. Conventional coatings achieve high selectivity – a measurement that indicates how effective a coating is at blocking heat but letting in sunlight – by stacking up to five layers of varying compositions and thicknesses on a glass pane. Most coatings use expensive silver nanolayers sandwiched between other layers of various materials. Creating these multi-layered coatings is a complex, expensive and rigorous process. Each layer is deposited sequentially over the pane of glass using a physical vapor deposition technique. Conventional coatings repeat this physical vapor deposition technique several times to create the multi-layered coatings. “In response to this, we have developed a glass coating made of a single layer of cheap, metallic oxide material that can block heat at nearly the same rate as the highest performing multi-layered coatings currently on the market, while minimizing manufacturing costs,” Gougham says. “By avoiding the need to repeat the vapor deposition technique several times, we have reduced the complexity and energy requirement of the manufacturing process, as well as the manufacturing cost, contributing to a more sustainable production process and product,” Dr. Gougam said. 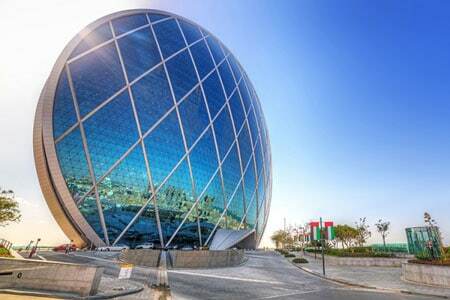 The team’s innovative glazing technology may give the UAE’s glass manufacturing sector a considerable competitive advantage in the region, as building developers seek more sustainable building materials in response to the growing push for “green buildings” that are more environmentally friendly. Researchers estimate that optimized glazing can reduce a building’s cooling load by as much as 20%. That is significant in a country like the UAE, where air conditioning accounts for up to 75% of peak electricity use in the summer months. The researchers plan to continue studying ways to optimize the metal oxide coating while keeping the manufacturing process as simple and cost-effective as possible. The next steps involve scaling up the application of the coating to ensure that the same level of selectivity is achieved on a larger glass pane, then performing environmental tests to ensure its long-term suitability and sustainability in the harsh climate of the United Arab Emirates.